This Day In History – July 11 | "Northern Crossings"
You might want to go back on this site and read the blog for June 8 of this year. On July 11, 1955, this day in history, President Eisenhower signed a bill requiring use of the inscription ‘In God We Trust’ on all paper money. Since we fight about everything in this country it is interesting to see how things like the motto have come around and disappeared and come around again. 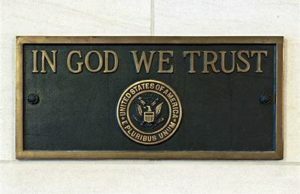 Recently the fight erupted at the state legislature in Minnesota over a bill that would allow schools to publish, somewhere on their property “in God we trust”. One of the law makers said a God who “spoke against money, is the God whose name is supposed to be on the money I carry around in my wallet”, or something to that effect, and he found the whole idea offensive. Of course the gentleman has his opinion and that opinion is well taken, but I’m not sure exactly what he’s talking about. Jesus never really speaks against money but he talks a lot about the offense that is the love of money. His remark about the coin of the realm, the denarius, and asking whose inscription and whose signature is on it, I am sure had more than a little sarcasm to it. “Render unto Caesar the things that are Caesar’s, and unto God the things that are God’s” according to some people I have read, could be translated “if this guy cares so much about this stuff that he has to plaster his face and name on it, then give it to Him. But give to God the things that are due to God, like worship and respect etc. Some get religious when there are times of trouble. The motto was proposed to be placed on currency during the Civil War for the purpose of “placing the North under divine protection”. There is a certain superstitious tinge to this. Its like the folks that show up at the church and attend for a while in order that they can use the church for a wedding. Once wed of course, they never show up again. The encouragement to put the motto on money was made at the beginning of the war. As it went on and the casualty rates rose there was a proposal to amend the preamble to the Constitution to declare “Almighty God as the source of all authority and power in civil government.” That went to defeat and shortly after the Civil War the controversy died down and God was put on the shelf again. The “secularization” of the US was in full bloom. The fight would pop up again and again sporadically in times of trouble and someone as notable as Teddy Roosevelt felt that putting God’s name on coinage was “sacrilegious”. His stand showed that there is “a problem of God” for society. We see it all over and the small issue over the display of a motto, “in God we trust” is a small slice of a much bigger pie. God causes a problem in society for theologians who have to either deny or affirm His creation of and guidance over the powers that be. It is a problem for politicians and legislators who find themselves either defending or working against people who are basically Godless. It is a problem for historians who try to wend their way through historical forests while trying to analyze each tree, and see where God is at in context. I remember the problem of God defined for me when my Pastor refused to support mandatory prayer is school. His reason is fascinating but like everything else if I tell you what it was it will just cause another fight so…. This issue came up again during the administration of Eisenhower and the historical context of course was the fear of “Godless Communism”. We don’t seem to have much of a fear of “Godless” anything today. Being Godless is a source of pride for many. In fact it might be the new litmus test for Supreme Court nominees for some folks. The motto is a way of stating a concept which itself is based upon God demanding obedience to Him alone and the restrictions that places upon believers. The First Commandment contains within itself all others. That is the problem of God is a society like ours – God is pretty exclusive, we are not. NextLWML Young Women Reps and Guest – MInnesota North.